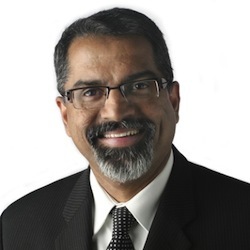 May 5, 2014, 11 a.m.
Raju Narisetti: Can the Pulitzer Prizes do more for journalism? The Pulitzers cause a stir in newsrooms one Monday a year. Could they be structured to promote the value of good journalism the other 364 days a year? By Raju Narisetti @raju May 5, 2014, 11 a.m. The 98th-annual Pulitzer Prizes in Journalism, Letters, Drama and Music, awarded on the recommendation of the Pulitzer Prize Board, were announced a few weeks ago by Columbia University. In his 1904 will, Joseph Pulitzer, the Hungarian-American journalist and newspaper publisher, left $2 million to Columbia University. Upon his death in 1911, most of that went to the founding of the School of Journalism in 1912, with some 25 percent going to establish the Pulitzer Prizes, first awarded in 1917. The prizes were intended by Joseph Pulitzer to be an “incentive to excellence” in journalism and beyond. But, as in many recent years and after months of anticipation, another set of Pulitzer Prize winners grabbed our attention for only about 48 hours, after which the world of U.S. journalism and its many critics got back to the endless “whither journalism” questions. The decision not to award a prize for Feature Writing while listing three finalists and a minor ABC News kerfuffle over the prize for Investigative Reporting got a bit more attention beyond the 24-hour news cycle, for all the not-so-great reasons. Totally lost along the way was how the 1,132 entries judged this past year were the most in recent years*, surpassing last year’s total by some 50 entries. The prizes were chosen by some of the best and brightest minds in American journalism — initially in a large jury of peers and, finally, by a prestigious board. But the fact that almost none of them will talk much about the process, even after it is complete, means the work has to sink or swim on its own. And, sadly, because of the Pulitzer Prizes’ process and tradition, it mostly sinks without much of a trace. As a result, the pinnacle of another great year in American journalism, a year of vibrant and impactful work amid all the business model turmoil and pessimism — not just the eventual winners, but also all the finalists — is simultaneously celebrated and forgotten in a day. Is this the annual incentive to excellence that Joseph Pulitzer envisioned? Is his namesake prize doing all it can, in this difficult period, for the craft and profession of journalism, American or otherwise? If one of the fundamental goals of the prizes is to encourage great journalism — not just its creation but also its reach — the December 31 publication deadline causes a significant logjam of some very compelling work being pushed out in a month when U.S. readership is often the lowest, because of all the holidays. This is particularly true of multi-part journalism, with the last 10 or 12 days of December littered with great journalism that often finds small audiences. Won’t this rush be true of any deadline, you ask? Indeed. But one wonders if shifting the deadline earlier or making it say, March, might help spread the stories out. After all, there’s nothing particularly sacrosanct about a calendar year in journalism and a deadline that falls outside the December holiday period or August, when much of the country is not consuming as much journalism, could mean a more “normal” audience for great journalism finales. In a similar vein, as a part of the application process, should the prize submissions be required to more formally show the impact that the entries had in terms of reach and readership? Such data may not be complete, is difficult to quantify, and is not the end in itself. But perhaps formally asking for it would help focus on the need for newsrooms to create compelling experiences with such journalism rather than merely producing ultra-long projects. And in an era where the role of any journalist needs to be redefined to include bringing his/her journalism to the widest possible audience, more formally measuring great work with this additional prism ought not to take anything away from great acts of journalism. Moreover, asking for such impact — beyond the cliched statements from friendly congressmen vowing to take action on a particular issue — could also push editors not to artificially shoehorn big journalism into that week before New Year’s. The secrecy around the jurors, while very well intentioned, does a disservice to the extent that it doesn’t celebrate the idea of the prizes being picked by some of the best (well regarded, at least) journalists in the country. There could be a significant halo effect in celebrating each year’s jury beyond just releasing a list of jurors on the afternoon the prizes are announced. The jurors are repeatedly warned — in writing and orally — to avoid talking specifics and, in recent years, a majority of them remain entirely silent about good journalism. This is unfortunate because, as anyone who served on the jury will admit, while it is hard work to plough through so many entries in about 48 hours of sequestration at Columbia University, the overwhelming sense, during and after the fact, is how wonderful and refreshing it is to encounter so many examples of great journalism from so many newsrooms big and small around the country. This sense of hope and admiration for fellow journalists and the profession is almost entirely dissipated by the time the awards are formally announced. Because, much like invitations to Davos, the honor of being a Pulitzer Prize juror is by invitation only — and for maximum two-year stints at a time — even well meaning jurors stay silent, lest they never get invited again. What ought to be a somewhat aspirational badge of journalism honor — serving on the Pulitzer Prize jury — is not being leveraged in the cause of spreading excellence in journalism. There are creative ways to keep the judging process itself a mystery while leveraging the jury. For instance, imagine a series of talks by jurors, supported by someone like the Knight Foundation, in journalism schools throughout the U.S. on the quality of the work they came across in 2013 — even if it’s done without going into specific deliberations. Something along the lines of what winning newspapers occasionally do. In its decision to not name the finalists until the winners are actually announced, the board has sided in favor of secrecy over the potentially larger opportunity of great journalism getting larger audiences. Why not reconsider formally announcing the finalists several weeks before the board announces the eventual winners? There’s a reason why the work nominated for Academy Awards tends to find wider audiences between the time nominations are announced and the winners being named. This is also how Hollywood’s best work can help avoid some of the perils of a small December theatrical release to meet Oscars deadline and usually reach wider audiences. This is by no means a new suggestion, and the steadfast secretive approach to finalists was likely reinforced by years of lobbying and horse-trading, indulged by some top editors in Washington and New York in yesteryears. The more recent fears — at least as articulated by Pulitzer board members in private — are around how corporations and others, who might be unfavorable subjects of some of the finalists’ work, could mount efforts to malign the work in advance. But it would be somewhat strange if a board made up of some of the most steely minded news industry icons — used to dealing with all sorts of political and corporate pressures in their own newsrooms — felt they couldn’t stand up to lobbying and the pulls and tugs of any awards process. By worrying about their ability to handle external pressure and resorting to secrecy, or just worrying about the perception of likely pressure, is the Pulitzer board not doing a disservice to what the prizes could achieve if the finalists are more publicly celebrated? Does the larger benefit of allowing the work of the finalists to be much more widely consumed — thus creating a more open sense of excitement about eventual winners and putting a much longer focus on the best journalism that our struggling newsrooms are producing — not outweigh the narrower considerations of secrecy as the easiest way to manage the sanctity of the process? The tradition of the Pulitzer Prizes being awarded at an invitation-only luncheon ceremony at Columbia, usually a month after the winners are announced, began in 1984. (Before that, the Pulitzer Prize certificates, medals, and checks were sent in the mail!) There is one brief speech by the board chair, a group photo, and then lunch. As awards ceremonies go, it is low key and a well kept secret, except for the winners and their newsrooms. In 2005, the Pulitzer.org website began posting a group photo of winners; in 2007, it added a picture gallery from the lunch, and in 2008, it added a video of the speech. What if the event were livestreamed? Why restrict the formal celebration of great American journalism to the room — why not open it up to the world at large? Isn’t there likely to be a significant and interested audience that wants to see and hear from those who have created the best journalism of the past year? In considering livestreaming, could the board help do more to help promote the cause of good journalism than a closed-door lunch does today? Why is a more celebratory approach to the best of the best at odds with the gravitas of the Pulitzer Prize? The Pulitzer Prizes have no logo, and the much-coveted individual prizes come with cash and a certificate that resembles any other certificate. Over the years, the prize for the news organization that wins the Public Service Pulitzer — the iconic Pulitzer Prize Gold Medal — has, by default, come to represent all the Pulitzer Prizes. Even then, chances are that very few people, even in the winning newsrooms, know that the medal was designed by Daniel Chester French (and an associate, Henry Augustus Lukeman), the same person who sculpted a seated Abraham Lincoln at the Lincoln Memorial in Washington. On one side of the silver and gold-plated medal: Benjamin Franklin. On the other, in a nod to its heritage: a bare-chested printer at work. Surrounding the printer are the words “For disinterested and meritorious public service rendered by an American newspaper during the year” in question. If we are to win the hearts and minds of future generations — and if we believe, like Joseph Pulitzer did that in the power of powerful storytelling — why not create some contemporary buzz and stories around the award itself, with an iconic, instantly recognizable presence that signals excellence in journalism? Every year, Columbia publishes an updated edition that lists the winners and finalists with citations in a small, all-text, printed book that resembles the citations one would see listed at end of nonfiction books. It’s an understated, dull experience, and about as removed from the increasingly multimedia journalism that win the prizes as one can deliberately get. To its recent credit, winning journalism entries (including photographs and editorial cartoons) from 1995 onward are available on the Pulitzer Prizes website, though it is unclear how much of an audience the site generates throughout the year. Meanwhile, all of the winning entries from 1917 are on microfilm at Columbia. Is the Pulitzer Board missing a trick or two in not making available on, iOS and Android, an annual Pulitzer Prizes multimedia app that packages all the winners and finalists into one offering, both a collectible as well as a modern teaching tool for newsrooms and journalism schools? Especially if it reconsiders its policy of not announcing finalists in advance, such an app could see significant downloads and audiences. Something along the lines of what folks at Flipboard created within hours of the Pulitzer Prizes being announced, but with a lot more supplementary material and archives currently available only on the Pulitzer website. Over the years, contrary to perception, the Pulitzer Board has made significant changes to the original Joseph Pulitzer list of four awards in journalism. Is it yet time again to revisit the categories? Take, for instance, editorial cartooning, which has recently struggled to attract enough nominations beyond the small class of usual suspects. Or is there an opportunity to dramatically raise the profile and impact of the prizes, making it the pre-eminent global journalism prizes by creating a new category — perhaps one awarded to non-U.S. English newspapers writing about America? Technology has shrunk the world of journalism, bridging time and distance that used to exist in the Joseph Pulitzer era. How about a new category, which, while still about journalism related to America as perhaps he originally intended, can become a major, aspirational goal, helping promote and highlight compelling journalism from outside the U.S.? In a May 1904 article in The North American Review, Joseph Pulitzer summed up his vision: “Our Republic and its press will rise or fall together. An able, disinterested, public-spirited press, with trained intelligence to know the right and courage to do it, can preserve that public virtue without which popular government is a sham and a mockery. A cynical, mercenary, demagogic press will produce in time a people as base as itself.” Is there anything that gives the Pulitzer Board pause in imagining that vision also could include coverage of “Our Republic” by an “able, disinterested, public-spirited press” outside of America? Of course, there would be logistical challenges to managing and vetting global entries — but surely that is not enough of a hurdle to engage in a debate over the value of thinking beyond American shores. After all, Joseph Pulitzer was a first-generation immigrant whose first journalism job was at a German-language daily, the St. Louis-based Westliche Post. In the interim, how about opening the Pulitzer jury pool to non-American editors, as a first step toward adding a board member or two from outside the U.S.? With Sig Gissler’s announced retirement, the Pulitzer Board has some really impactful, big shoes to fill in its next Pulitzer Prize administrator. In his twelve-year tenure*, Gissler has, with deliberate speed and no fanfare, helped nudge the prizes into a digital era, implementing the formal mandate of the board. While the Pulitzer Prize administrator technically reports to the president of Columbia and articulates and enacts the collective wisdom of the Pulitzer board, there is perhaps an opportunity to use this hiring to find an administrator who can also be a strong public advocate for excellence in journalism. Finding someone who could match Sig Gissler’s professional gravitas — editor of The Milwaukee Journal and a faculty member of the Columbia Journalism School — but who would also write about contemporary journalism issues (perhaps a regular column in Columbia Journalism Review?) and speak more prominently and publicly at journalism industry events would go a long way toward raising the profile of the Pulitzer Prizes and journalism excellence throughout the year. It’s quite likely that many of these suggestions would run into a variety of hurdles, some real and some imagined — including the obvious fact that many of these ideas have been debated by the Pulitzer board for many years. Some of these suggestions, if implemented, would require more financial resources. Currently, each submission is charged a very modest $50 handling fee. It’s quite conceivable — and perhaps would be met with little argument — that organizations of a certain size ought to pay multiples of that entry fee, as most do now for many other journalism prizes that cost $100 to $200 to enter. (Higher fees across the board might deter small news organizations.) After all, many large news organizations spent thousands each year creating the Pulitzer Prize “books” they submit. An annual multimedia app could also be sold as a way to raise revenue. It’s also quite conceivable that there are many organizations, including nonprofit ones such as the Knight Foundation, which would be willing to support and underwrite other costs in the interest of promoting journalism excellence. It’s difficult to imagine that when Columbia and its journalism school actively solicit third-party funding, that the Pulitzer board, steeped in managing church and state issues in their day jobs, would have to worry too much about potential funders influencing prize choices. The Pulitzer board has firmly been on the side of secrecy in its deliberations and refusal to publicly debate or defend its decisions. And keeping a very low-key profile throughout the year has not reduced the reputation of the Pulitzer Prizes as America’s most sought-after awards in journalism. But like all great traditions, the prizes could perhaps also use some rethinking — especially if new approaches can help the larger goal of serving journalism. Joseph Pulitzer was a fearless innovator, the man who made the first extensive use of illustrations in newspapers and, perhaps, the very first Kickstarter — raising public subscriptions for the building of a pedestal at the entrance to New York Harbor so that the Statue of Liberty, which was stranded in France awaiting shipment, could be emplaced. He believed that “the power to mould the future of the Republic will be in the hands of the journalists of future generations” and deliberately left behind a flexible will for an advisory board to fulfill his mandate. Perhaps it is worth asking, in 2014: What would Joseph Pulitzer want us to do? Raju Narisetti is senior vice president for strategy at News Corp, the publisher of The Wall Street Journal and other newspapers. He was a news editor in the Journal newsroom that was awarded the 2002 Pulitzer Prize for Breaking News Reporting for its 9/11 coverage. In 2010 and 2011, The Washington Post won three Pulitzer Prizes in teams he oversaw as a managing editor. In 2013 and 2014, he served as a Pulitzer Prize juror. Correction: This article originally said that Gissler had been Pulitzer administrator for 14 years instead of 12. And while this year’s entry count was the highest for some time, it was still lower than peak years in the 1980s and 1990s, when the number of entries topped out at 1,770. 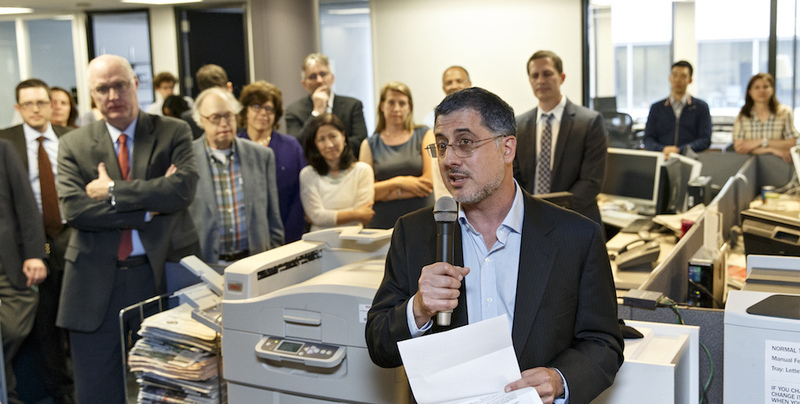 Photo — of Washington Post contributing writer Barton Gellman, addressing the newsroom after its Pulitzer Prize for Public Service win April 14 — by AP/J. Scott Applewhite. POSTED May 5, 2014, 11 a.m.
Narisetti, Raju. "Raju Narisetti: Can the Pulitzer Prizes do more for journalism?." Nieman Journalism Lab. Nieman Foundation for Journalism at Harvard, 5 May. 2014. Web. 19 Apr. 2019. Narisetti, Raju. "Raju Narisetti: Can the Pulitzer Prizes do more for journalism?." Nieman Journalism Lab. Last modified May 5, 2014. Accessed April 19, 2019. https://www.niemanlab.org/2014/05/raju-narisetti-can-the-pulitzer-prizes-do-more-for-journalism/. | title = Raju Narisetti: Can the Pulitzer Prizes do more for journalism?